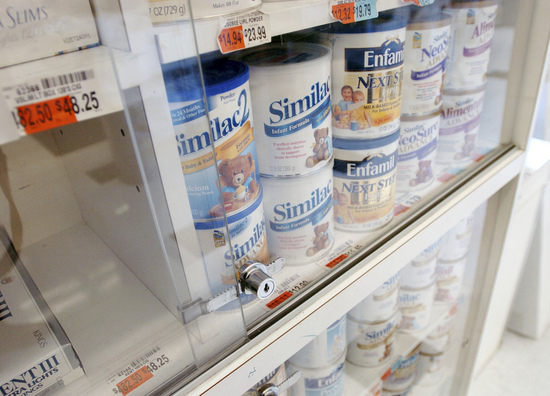 Baby formula is often one of the hotter items for thieves to steal for drug money. According to local police, baby formula commands a high resale value and more than $570 in baby formula was stolen from a Pittsfield Township Meijer in September. A thief walks out of a local Kroger with a shopping cart full of meat. More than $500 of baby formula is taken from a Pittsfield Township Meijer. Someone steals 10 cases of Red Bull from a Saline store. Saline police arrest a woman with stolen 13 bottles of liquor in her car. What do all of these crimes have in common? Local police say it’s drugs. Detective Don Lupi of the Saline Police Department said these types of thefts often can be traced back to drug addicts who have already burned their bridges with family and friends as they seek more drug money. When it comes to larger grocery retail frauds, the police term for shoplifting, desperation is often the biggest motivation, he said. Saline and Pittsfield Township police have seen a number of these grocery thefts in the past three months. Pittsfield Township police have investigated the thefts of meat from Kroger and baby formula from a Meijer, while Saline police have investigated the Red Bull thefts and repeated liquor thefts from Country Market location. The thefts of groceries are often one of the more visible signs of the world surrounding the acquisition of highly addictive drugs, such as heroin and cocaine, according to police. Pittsfield Township Deputy Chief of Police Gordy Schick said shoplifters are often divided between people stealing to support a drug habit and people who shoplift for the thrill, or to get something for free. However, it can be fairly easy to separate the two types of criminals when the crimes present themselves, Schick said. He pointed to a theft of several TVs from a township Meijer location and the September theft of a shopping cart full of meat worth $150 from the Kroger at 3200 Carpenter Road as thefts that were clearly not for personal use. “They’ll take it and try to resell it to folks in the community or to other businesses, but it’s not something we see all the time,” Schick said. Pittsfield Township presents a unique challenge for the township’s Department of Public Safety, Schick said. The large number of grocery superstores and other national chains means there’s often a high amount of shoplifting incidents in the area, which pull police officers off of other cases, he said. Many of the stores are also open 24 hours a day, seven days a week, which allows potential thieves a larger window of opportunity, Schick said. Nationwide, there are an average of 550,000 shoplifting incidents every day, resulting in more than $13 billion in lost goods for retailers every year, according to the National Association for Shoplifting Prevention. According to the NASP, 25 percent of shoplifters are juveniles and 55 percent of adult shoplifters report they began stealing in their teens. In Washtenaw County, police agencies reported 1,053 felony retail frauds in 2010, according to the Federal Bureau of Investigation’s Uniform Crime Report. However, Schick reported earlier this month that shoplifting offenses in Pittsfield Township are actually down considerably from the same point last year. The incidents are increasing this month. As the holidays draw ever nearer, police are dealing with the busiest time of year for shoplifting, he said. Saline police arrested Amanda Willard, a 26-year-old Milan woman, on the suspicion that she stole 13 bottles of liquor from the Country Market in Saline. Lupi said Williard told investigators that she had a heroin habit, something becoming more and more common in the city. Dr. Kirk Brower, a professor of psychiatry at the University of Michigan, said addiction to drugs like heroin and cocaine are particularly strong. Brower said hard drugs like heroin can not only cause an intense high, but also have an extremely powerful withdrawal. That withdrawal can drive people to do things they otherwise would never think of, such as stealing from family or friends - or their local grocery store. Brower, Lupi and Schick all said they’ve seen much greater numbers of people becoming addicted to heroin in the past few years than any time in the last decade. Brower said access to heroin has simply become much easier than at any point in the previous five to 10 years, leading to more adolescents and teenagers becoming users of the drug. If these users fall into the potentially deadly addiction cycle, it’s not out of the question that there will be more incidents of addicts stealing to get the chemicals they need, Brower said. Last year in Pittsfield Township, the newly-formed community patrol unit of the Pittsfield Township Public Safety Department decided one of the best ways to deal with the township’s shoplifting problem was to bring all of the township’s retailers together. Schick said the two officers convene with representatives from each of the township’s major retailers and have a round-table discussion, which includes information on recent thefts, names of possible suspects, photographs of potential suspects who got away with crimes and details on what information is needed to build a criminal case. “It’s been a home run for us, because we’ve been an engine to put together a sharing of the information and that’s the most difficult part,” Schick said, mentioning that three felony cases were put together at the group’s first meeting. Occasionally the meetings have guest speakers and have included at least one Washtenaw County judge, Schick said. One of the more beneficial meetings included when Washtenaw County prosecutors came to the meeting and explained to police and store representatives what it takes for them to charge someone in a retail fraud case, what kind of evidence they would need to have and the process of how someone is charged with a crime, Schick said. It helps to have the stores, police and prosecutors on the same page, Schick said. “It’s keeping the information flowing,” he said. Lupi said Saline police have direct communication with stores in the city and often share information with them to find potential thieves. The police report from Willard’s arrest alleged she had been in Country Market several times and had the same process every time she entered, which the store manager shared with police. It’s not uncommon for arrests to be made because an employee or store manager makes an observation like that, he said. Tue, Dec 20, 2011 : 4:45 p.m.
First an addict walks into a low life party store or gas station and asks the owner if they need something or what they are running out of. The owner then tells them what they need and how much they are willing to pay for the stuff. The addict then decides if it is worth it and if they can get there fix for the day. if so then they will go and steal it from where ever is easiest. It's not the addicts fault that they are addicted, but because of the legals, they have really no choice but to steal the stuff. I drugs were legalized it would take the criminal element out of the equation here. People could go to a n injection sight and get their drugs for free or on the public, which would only cost the tax payers $10 a day. This cost is pennies compared to the $mega amounts we pay to keep them in jail or the insurance spikes. It's the low life store owners that are looking to buy cheap goods they can sell for retail prices who are to blame here.' ' To all the law officers: There needs to be an investigation on independent stores, be it gas stations or liquor stores, and the like. These are the places who buy the stolen goods, and I believe are the guilty ones. Addicts will do anything to not be sick and detox, and this is a fact that everyone should know. A quick buck to take care of an addiction is the only thing on the addicts mind 24-7, because there is no other way to get their fix for the day. Tue, Dec 20, 2011 : 10 p.m.
Tue, Dec 20, 2011 : 4:43 p.m.
Tue, Dec 20, 2011 : 6:52 a.m. The solution to drug addiction is proven NOT to be eliminating the supplies. It's no great intellectual challenge to arrive at the proper solution: eliminate the users. Tue, Dec 20, 2011 : 12:53 a.m.
Good, detailed article Kyle. Thanks for writing this. Mon, Dec 19, 2011 : 11:58 p.m.
Mon, Dec 19, 2011 : 9:11 p.m.
BTW, if anyone who lives within the city limits of Ann Arbor tries to claim that marijuana is a public danger, they're not paying attention. If even a fraction of the people who smoke weed in Ann Arbor turned to hard drugs and criminality, this city would be total chaos. The math just doesn't work out on that claim. Tue, Dec 20, 2011 : 5:28 p.m.
To Mike: Are these proven facts, if so please provide sources for I can read them. Thanks. I work with addicts, and none of them have the same experiences with drugs in general. Although the addiction outcome does have similar traits. Please tell me where you got this information from. Tue, Dec 20, 2011 : 1:57 p.m. The people who smoke it are not dangerous, they're dumbed down, can't learn, can't get out of bed to go to work, are unmotivated; dangerous no. I suppose this is good for society, right? Addictions to hard drugs are a real tragedy. These addictions can lead people to the lowest of human behavior. I do have to correct a misconception though: Marijuana is only a &quot;gateway drug&quot; in the sense that despite its illegality, it's relatively plentiful. So people will use it first in their experimentation with illegal substances. It's a procedural path, not a chemical path. The columnist William Raspberry pointed out many years ago that lying to our children about marijuana actually does a disservice to the greater issue of treating addictions. When younger folks try marijuana, and find it to be relatively benign, they begin to question society's warnings on hard drugs. If society were more honest by marijuana, the message of the dangers of hard drugs wouldn't be nullified. In terms of decriminalizing drugs, it would probably be wiser than pouring trillions of dollars into a war we cannot win. It would be better to remove the &quot;teehee, I'm doing something bad&quot; stigma and treat misuse/abuse of these substances as a health issue. The side benefit of decriminalization is that it would remove the criminal world's ability to conduct business with hard drugs -- thereby minimizing the amount of drug-related killings. Decriminalization isn't something the U.S. could do overnight. It would have to happen over time and with the cooperation of various agencies and our community. Tue, Dec 20, 2011 : 5:48 p.m. Drugs do not make an addict, if that were the case then a deck of cards would make a gambler. Are you saying that computers, gambling, food, etc.. are all caused from pot??... or just a deck of cards make a gambling addict. There are way too many holes in this theory, and the only reason it exist is because it fits the puzzle, but simply not true. Although I do agree that decriminalizing drugs will take the criminal element out of the equation. Also, it will make for safe drugs. There should be government ran injection sights instead of prisons. This would prove to be much cheaper and allow the addicts to find jobs and stuff, instead of consuming their entire day to finding a fix. Tue, Dec 20, 2011 : 5:37 p.m.
Mon, Dec 19, 2011 : 6:28 p.m. I really don't think people who smoke marijuana regularly are walking out of grocery stores with cart loads of baby formula. I think we are talking about highly addictive drugs like meth and heroin. Merry Christmas, everyone! Mon, Dec 19, 2011 : 9:34 p.m.
And when they do walk out with that bag of chips without paying I'd imagine there was no malice intended... they simply forgot lol. Mon, Dec 19, 2011 : 9:24 p.m.
No, like, wow, man, they walk out with bags of potato chips. Mon, Dec 19, 2011 : 8:52 p.m. Thanks for stating your premise as an opinion and not a fact. More people need to do this. And, Merry Christmas too you, also! Mon, Dec 19, 2011 : 4:26 p.m.
Mon, Dec 19, 2011 : 5:27 p.m.
Who else is an expert in art of thievery? Mon, Dec 19, 2011 : 2:55 p.m.
Addiction is pretty much the only disease where it's socially acceptable to be mad at someone for having it. Mon, Dec 19, 2011 : 3:41 p.m.
Mon, Dec 19, 2011 : 2:48 p.m.
Hmm, could it also be that Baby formula is such a big target because tons of single mothers can no longer afford to feed their children in Michigan? Mon, Dec 19, 2011 : 5:56 p.m.
No no. An addition to illegal drugs is the ONLY possible motivation anyone can have to commit a crime in this town. Mon, Dec 19, 2011 : 4 p.m. I guess you have never shopped for a deal and asked yourself if you would feel better if you paid more for the same item. Mon, Dec 19, 2011 : 1:41 p.m. Does this explains why baby formula often appears for sale on craigslist? Mon, Dec 19, 2011 : 5:02 p.m. I hope nobody goes looking for baby formula on craigslist. Not always. Formula companies give free samples to new moms in the hospital, and will mail vouchers/coupons for free or greatly reduced formula. Some of those get re-sold by breastfeeding families or others who don't need them. Mon, Dec 19, 2011 : 1:30 p.m. The moral of the story is if you're looking to score heroin, go to Saline and hover by the refrigerator cases. Mon, Dec 19, 2011 : 12:31 p.m. The real problem is that our society, despite medical confirmation that addiction is a disease, still treats addiction as if it were a matter of &quot;will&quot;. Thus addicts are seen as weak-willed and undeserving of help, when in fact, addiction is as a legitimate a disease as cancer. Does anyone think it would be reasonable to say to a cancer patient &quot;sorry, you've had enough treatment - good luck with that&quot;? But that is exactly what happens to addicts every day, as the overwhelming majority of medical systems put limits on the treatment of addiction. However, it is fairly clear that people think nothing of harsh punishments for criminals who commit crimes as a result of their addictions. I'm not saying that crimes should not be punished - but in the long run, it would be more humane and cost-effective to treat the disease first. Mon, Dec 19, 2011 : 5:43 p.m.
Are you saying their aren't enough treatment programs, therapists, psychologists, psychiatrists, company drug programs, school drug programs, and health insurance premium dollars being spent on this? Rubbish. Mon, Dec 19, 2011 : 4:16 p.m.
that's right, no one should have personal responsibility for thier actions, we shouldn't be asking that of anyone anymore! Mon, Dec 19, 2011 : 3:45 p.m.
Mon, Dec 19, 2011 : 2:30 p.m. However, while they're locked up they're not stealing and it gives them a chance to become clean! Mon, Dec 19, 2011 : 1:36 p.m.
Addiction IS a disease, but is totally avoidable if the person has the willpower to stay away from the drug in the first place. Some cancers are avoidable, but many are not. There is a definite difference here. Willpower is always a factor in addiction. Mon, Dec 19, 2011 : 1:32 p.m.
A major difference between addiction and cancer: cancer patients didn't have a choice. Mon, Dec 19, 2011 : 12:28 p.m. I went strait to meth laced heroin speed balls- but then I consider that almost natural. Seriously though, the most addictive drugs we face are alcohol and tobacco, both of which are both available at Kroger and Meijer. Maybe we should have retailers remove items like this so the resulting addicts won't be there to shop lift. Oh wait didn't they try half of that that during prohibition? The long and short of it is that society cannot force people to behave without great cost. My answer is good parenting and constructively engaged children who know what good choices are. Tue, Dec 20, 2011 : 5:43 a.m. Although I do promote this positive approach, I have to note that even kids with good parenting who have been educated on the dangers of drugs, and, benefits of good decision-making, can and do, unfortunately, and very sadly, become addicts. Mon, Dec 19, 2011 : 1:52 p.m. Yes, of course you are right in an ideal world, but what do we do with the people who haven't had the benefit of good parenting and a stable and nurturing environment? Lock them up or send them to treatment? You can't just wish them away. In the end locking them up costs more. Mon, Dec 19, 2011 : 12:40 p.m.
As an educator, I have to say that you are &quot;right on the mark&quot; with your comments. Mon, Dec 19, 2011 : 12:21 p.m.
the dopers will steal anything to pay for their next &quot;high&quot;. Mon, Dec 19, 2011 : 12:33 p.m. Wait, are you insinuating that legalizing marijuana might actually have other consequences? How dare you. Mon, Dec 19, 2011 : 12:10 p.m. Most of these drug addicts start off with that harmless, &quot;natural&quot; substance called marijuana. It then usually progresses into other drugs. But rest assured it is harmless and in many cases good for you, so I've been told. Where does the legalize drug crowd stand on this issue and all of the lives it ruins? Merry Christmas and Happy New Year to all. Thu, Dec 29, 2011 : 5:48 p.m. I hate when people misread studies and don't have the knowledge to understand causation vs correlation (or lack of). Tue, Dec 20, 2011 : 12:33 a.m.
Mike your right-- Here a quote from part an article( better to read the whole article ) to support your position written for The American Psychological Association ------UPFRONT Marijuana addiction a growing risk as society grows more tolerant May 2011, Vol 42, No. 5 Print version: page 13 "People take marijuana for the same reason they take other drugs: They make you feel good," Volkow said. That good feeling is tied to the dopamine-based reward system in the brain's nucleus accumbens region. Compounds in marijuana bind to the brain's cannabinoid receptors, triggering dopamine release and resulting in a high. Long-term use of marijuana not only increases the amount of the drug that users need to reach the same high, it also inhibits the brain's natural cannabinoids. As a result, over time users feel dysphoric and "off" if they haven't recently taken marijuana. Marijuana also targets and interferes with cannabinoid receptors in areas of the brain crucial to a number of cognitive functions, especially the cerebellum (movement), hippocampus (memory) and amygdala (emotional control). Interfering with those cognitive processes is particularly dangerous for young people's developing brains, Volkow said, and there's evidence to suggest using marijuana at an early age can have lifetime consequences. Twin studies show that people exposed to marijuana as young teens are more likely to become dependent on other drugs, such as cocaine and painkillers. Mon, Dec 19, 2011 : 5:42 p.m.
@Mike, I was just curious if you were speaking from a scientific study or your own personal experience / opinion, now I know. I'm sorry for your loss, truely. @Homeland....very well written. Mon, Dec 19, 2011 : 5:40 p.m.
Doug, you are right about Ron Paul and it makes a lot of sense to more and more people. I am one of them. He is one man who stands by his principals. Mon, Dec 19, 2011 : 3:42 p.m.
@blue marker - practical experience with two family members; on who is now deceased the other in recovery plus plenty of time spent with addiction professionals. You don't agree with my assertion or just curious? What's your source for this information Mike? Or is this just your opinion? Mon, Dec 19, 2011 : 12:38 p.m.
Can you believe that presidential candidate, Ron Paul, wants to legalize marijuana? He's an embarrassment to the medical profession. Mon, Dec 19, 2011 : 12:25 p.m.
Rather I think a lot start with the legal drug alcohol. Maybe we should return to prohibition? Mission Accomplished!